Mmm... BA Bible Belt pours very dark with minimal head. It's aroma is very complex right off the bat. Spicy, earthy, honestly pretty unique. Flavor profile-wise this is clearly a Prairie ale. It does not fall far from the Bomb, Christmas Bomb tree. It has a nice lingering bourbon character, a nice malty sweetness almost like a lactose sugar. It has a bit of a dusty rotten wood thickness in the aroma that carries through into the palate. Aside from fruit additions, this might be one of the coolest most unique flavored stouts I have ever had. While not quite as big as a Bourbon County, the bourbon is still very prominent. This is like the opposite side the of the spectrum from something like BA Old Rasputin, that while very good has a flatter flavor profile. This is not a simple ale. If I understand it, the base beer is Evil Twin, with the basic spice profile from Bomb. I keep going back to cork. Remeber that dark cork everyone bought and put on their walls back in the 80's. That is sort of the arouma of this stuff. I could see how someone might not like, I love it. It's unqiue. This page contains a single entry by Brewmaster published on March 4, 2017 9:01 PM. Funky Buddha - Maple Bacon Coffee Porter was the previous entry in this blog. 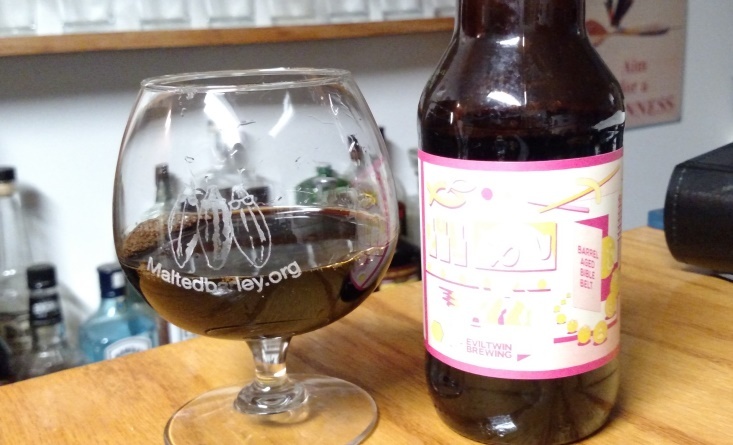 Terrapin - Tart Cherry Wake n' Bake is the next entry in this blog.